Insane Burn is a fat burning supplement brought to market by a company called Ignite Pharm and distributed exclusively via Amazon. The company does not appear to have an official website and only produces one other product. It’s a female-only fat burner called Fit Chick and, like Insane Burn, it is also designed to preserve muscle tissue. That’s not all the two products have in common. A comparison of the labels reveals they contain the exact same ingredients in the exact same quantities. This is very interesting because Insane Burn has supposedly been formulated especially for men. Further research revealed a number of other products, marketed by different companies, contain the same formulation. Reborn Labs have a fat burner “for her”, called Skinny Please. We also found an appetite suppressing fat burning combo called Phentamine HCL 37.5. All of this can only mean Insane Burn is a white label product. It also means the claims that the formulation is designed for women/men are pure hogwash. What is Insane Burn and How Does it Work? 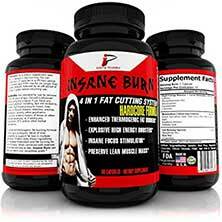 Insane Burn contains ingredients intended to speedup the fat burning process. The formulation also has stimulants to provide extra energy and boost mental focus. This should benefit anyone hoping to avoid diet-related fatigue or work out harder in the gym. The process of dieting can sometimes lead to a loss of muscle tissue, so the pills also contain ingredients to prevent this from happening. Caffeine: Caffeine is a stimulant, so it’s presence here should help support the aim of the blend. Its also has proven value as a metabolism booster and thermogenic fat burner. Phenylethylamine HCI: An ingredient derived from phenylalanine. It is believed to have value as an energy provider and a mood enhancer, but the effects are short-lived and unlikely to last longer than 15 minutes. Glucomannan: A natural fiber taken from the roots of the konjac plant. When taken with water it expands inside the stomach and creates a feeling of fullness. Glucomannan is an excellent appetite suppressant, but the European Food Safety Authority states three (1000mg) doses are required each day. The Energy and Focus Blend is only 450mg. Even if glucomannan was the only ingredient, the amount provided would be far too low. Fursultiamine: A thiamine derivative that is often deemed to have value as an energy provider. L-Tyrosine: An amino acid that may increase mental alertness when administered in high doses. The amount provided here is not known. Green Tea Extract: Research proves the claims made about green tea’s fat burning abilities are not unfounded. The extract also has the power to enhance the health in numerous other ways. Raspberry Ketones: A natural phenol that can suppress the appetite and speed-up the fat burning process. Two forms are available—a fruit extract and a synthetic version. The fruit extract packs the most power. The synthetic version is cheaper to use. The type used here is not specified. Yohimbe: Research carried out on volunteers at the Institute of Sports Medicine suggests supplementation with yohimbe can assist with fat loss when it is combined with resistance training. The ingredient is also believed to encourage lean muscle mass. Synephrine HCL: A fruit-based stimulant that boosts the metabolism and helps the body to burn its stores of fat. It’s presence here should also help give energy levels a boost. Kola Nut: An ingredient that contains caffeine. L-Carnitine: A study conducted on elderly volunteers suggests a link between L-Carnitine and fat loss and also supports the claims made for the ingredient’s ability to fight fatigue. Insane Burn is intended to be used in a cycle of 8 weeks on followed by two weeks off. Only one capsule is needed per day and it should be taken in the mornings. Customer feedback is plentiful and predominantly good. It may also be biased because many of the people who sing the product’s praises admit they were given a discount in exchange for their review. Insane Burn is not intended for anyone who is under 18 years of age and Ignite Pharm states potential users who have existing health issues will need to consult a doctor prior to commencing supplementation. The company offers the same advice to people using medication. A money back guarantee is offered, but the duration is not specified. It seems likely that Insane Burn will do most of the things that are claimed for it, because the claims made are a good match for the abilities of the ingredients used. However, the fact that some customers report side effects is an issue. The pills contain several stimulants and it could be the quantities involved are too high for some people to handle. If you have a high tolerance of stimulants, you may want to give the pills a go. If you do not you will be better off giving them a miss.